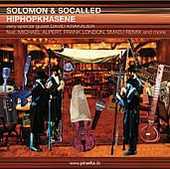 Solomon & Socalled's remarkable cast of musicians, including special guest David Krakauer, turn an authentic Eastern European Jewish wedding, the khasene, into a hiphop extravaganza complete with old-school Yiddish freestylin' on the mike from shtetl-MC Michael Alpert. Come join the wedding party, share in ancient marriage rituals and celebrate the Solomon & Socalled union of fiddle and microphone! Plus - an exclusive remix from SMADJ.